Richard Estes describes himself as a realist painter although he is more often described as a Photorealist. In fact, he is regarded as one of the founders of the Photorealist movement which emerged in America in the late 1960s. His paintings, in reproduction at least, may remind us of photography, and Estes has always used the camera to collect and record information from which he can paint, but he has never been concerned with copying the appearance of a photograph. Unlike many Photorealists, Estes is not interested in making paintings which show how the camera records information. He avoids painting areas of photographic focus and blur. Photography enables him to capture a moment in all its complexities and has resulted in a remarkably intricate representation of refracted light. However, because a photograph is limited by mechanics of exposure, focus and a single fixed lens, Estes compensates by painting from an assemblage of many photographs. Taken by himself, on location, what Estes' paintings share with photography is an authenticity. As with photography, we regard Estes' paintings to be a truthful representation of reality. But, on examination, it is clear that the means by which Estes represents the world is very different from photography. Estes, for example, introduces directional mark making to reveal form, in contrast to the homogenous flatness of the photograph, and makes substantial alterations to the construction of illusionistic space. The truth in an Estes painting is very different from that of the truth of a photograph. Ultimately, it is authentic not to the reality of our world, but the world created by the individual painter. As a realist, Estes utilises the particularities of the world around him to extend and develop his own artistic vision, and in so doing, orientates himself within a long tradition of painters such as Vermeer, Bellotto, Eakins, Hopper and Sheeler, all of whom he admires. 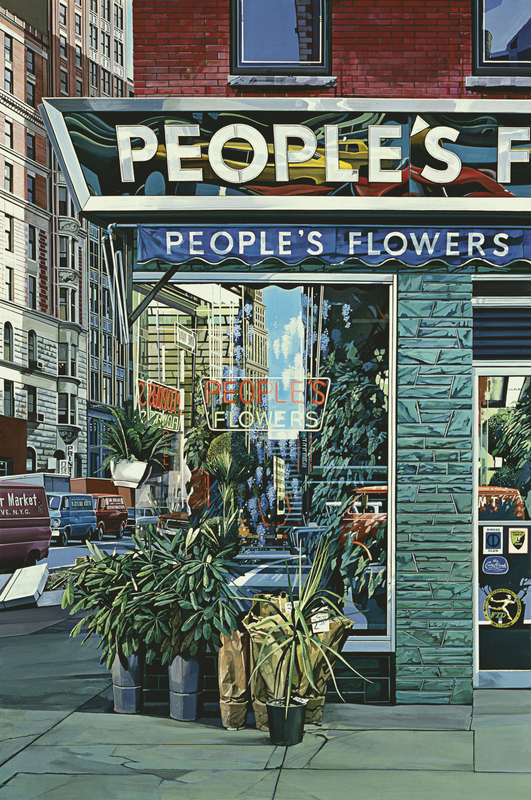 People's Flowers is early, pivotal, well known and one of Richard Estes' very best and most important paintings. The clarity, colour, subject matter and composition indicate a totally mature and fully developed Estes, leader of the Photorealist Movement at a point in time when all but a few of the other artists were still struggling to perfect their visions and styles. First, it is interesting to note that there are only five major Estes paintings with a vertical format (over four feet, or 125 cm, high). This was not a favoured format for the artist. However, the composition is innovative and flawlessly conceived. The concentric rectangles of the buildings and window frame bring the eye to the central focus point, the neon sign People' s Flowers. The line of trucks and the outdoor plants point to the sign as well. The sky in the reflection on the window also does the same thing. The descending width of the mirrored sign and the awning sign also bring the eye to the centre of the painting. The clarity of the reflection and the contrast of the primary-coloured red brick above the secondary-coloured green below are striking visual effects. Artists try forever to create this kind of eye-arresting imagery. It is the domain of the Photorealist, however, to discover and recognise this vision in the world around him, and then to capture it with the camera and recreate it with brush and paint. You who view this painting can and will begin to realise how to "look" and "see" and will be aware of the world you exist in in a new way.